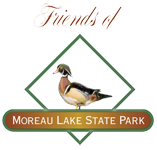 The Hudson-Mohawk Bird Club would like to honor Moreau Lake State Park and its Nature Center with our Sam Madison Award. The award is given out to organizations or individuals for promoting the education of our youth about nature and birds. The award will be given out at their annual meeting on April 15th. The club is devoted to field birding and the appreciation of wild birds. We have more than 300 members and cover the greater Capital Region of New York State. This includes the 11-county area surrounding Albany, which is Region 8 of the New York State Ornithological Association (NYSOA). The Hudson-Mohawk Bird Club is a charter member of NYSOA. We actively support the work of conservation organizations and other birding groups. The Hudson-Mohawk Bird Club got its start as the Schenectady Bird Club in 1939. The organization served birders not only in Schenectady and Scotia, but Albany and Troy as well. As time passed, the Club claimed the surrounding Capital District as its territory. In 1969, the name was changed to reflect the broader geographical interest of the club. Centered at the confluence of the state’s two largest rivers, HMBC stands ready to serve those who have an interest in the appreciation of wildlife. The purpose of the Sam Madison Award: The Sam Madison Award was established to encourage and enhance the education of students and teachers about birds, bird habitats, and bird conservation. Biosketch of Sam Madison: HMBC established the Sam Madison Award to honor the man who led and advised the Club through much of its history. He served as President, was Nominating Committee chair for as long as anyone can remember, and led field trips to a variety of places. Sam’s Delmarva Peninsula trip was legendary. With a military-like time schedule it was the “Bataan March” of the bird club. Perhaps Sam’s signal accomplishment was his role in acquiring our Reist Sanctuary in 1970. We all have our favorite Sam Story. They all remember an inveterate birder, a caring and sharing friend, and a gentleman in the truest sense.